This introduction focuses on the natural resonances of the Harmonic Series, which underpin the concept of pitch in Indian Classical music. In Indian Classical music, everything springs from the tonic, which is sounded throughout a performance. It is for this reason that Indian music has no harmony in the Western sense, nor does it modulate. At least one tanpura (see figure 1) is present in a traditional performance. This is a drone instrument resembling a sitar, but without frets. The tanpura generally has four open strings tuned to both the tonic and (almost exclusively) the 5th. These open strings are strummed repeatedly throughout a performance regardless of the rhythmic characteristics of the solo lines. 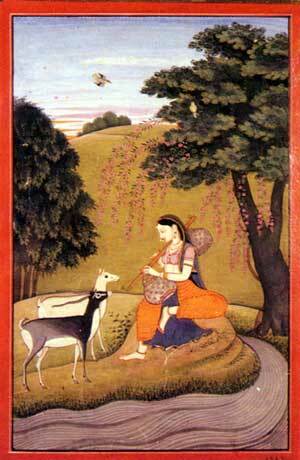 The tanpura is extremely resonant, with very clear harmonics. In Indian music the harmonic series represents the ascent from the earth-bound to the transcendent. This is why Indian music is tuned in accordance with the harmonic series i.e. with “just” intonation. Indian musicians tune the swaras to both the open strings and harmonics of the tanpura. In the past Indian music was always tuned in just intonation in relation to this drone. The rise of equal temperament in the west has unfortunately clouded this pristine purity of pitch, but luckily the finest Indian Classical musicians are keeping the tradition alive. 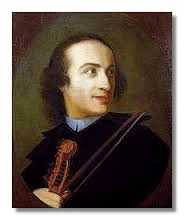 My hope is that in bringing together these musicians with their Western colleagues in a way which enables this purity of pitch to be maintained, we are helping to nurture and propagate this ancient tradition of mathematically pure tuning. The next section is a little technical, and aimed at string players, but it also illustrates the problem for any interested musician. One of the difficulties Indian musicians find working with their Western colleagues is tuning in the upper register, especially when working with strings when the violin E string comes into play. The complaint is so often “I find it so hard to play with western players as they get so sharp when they go higher”. 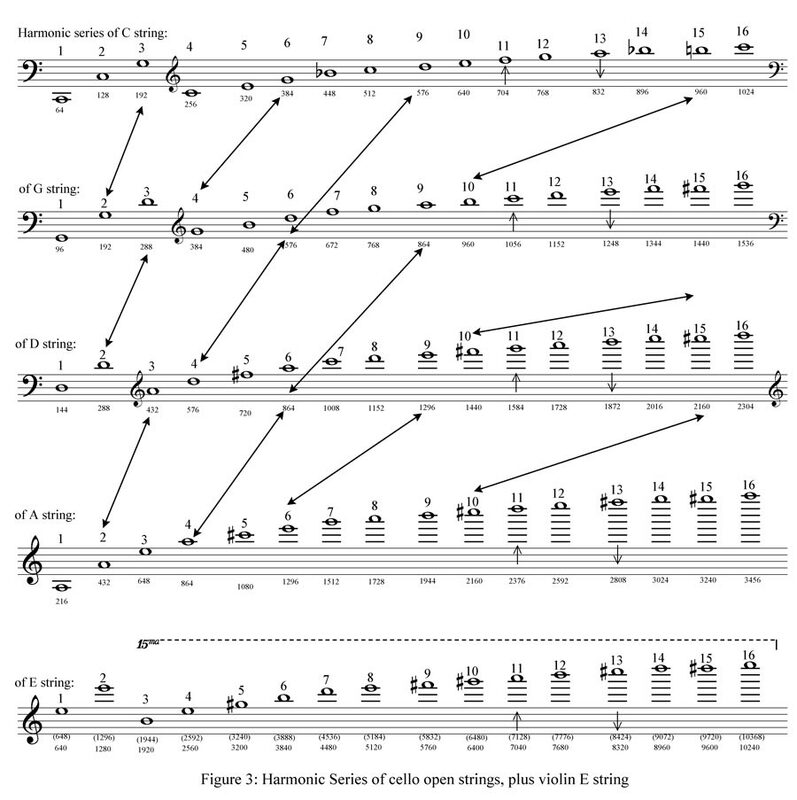 This simply follows the order of available open string pitches as they appear in the harmonic series of the fundamental tone (the low C of celli and bassi). As mentioned above, the open E string will feel very noticeably “flat” to the A string (as it is tuned to the harmonic series of the C rather than A string). However, there will be a very satisfying resonance between E and C strings. This is because the violin E strings will be vibrating at exactly 10 times the rate of the Cello C strings. Figure 5: How the ear perceives the E in relation to the G and A strings. The major 6th (G and E in these examples) is interpreted by the ear as the 3rd and 5th overtones respectively of the harmonic series of C (see harmonic series chart above). 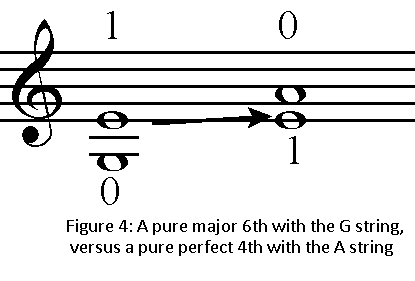 Because of the open A string, the perfect 4th (E to A) is interpreted by the ear as part of a harmonic series based on an A at the bottom of the bass stave. This happens because of the phenomena of the difference tone, (illustrated in figure 6 with diamond shaped notes) which is particularly noticeable when playing these examples with just intonation. The difference tone is perceived because the difference between the number of vibrations of the first finger E (vibrating at 320 Hz) and the open G (vibrating at 192 Hz) is 320-192 = 128 Hz. A pitch of 128 Hz emerges. Returning to the example in figure 4, in listening to the second double stop, (the perfect 4th), the ear wants to hear the E and A in their most natural relationship. This is as the 3rd and 4th overtones of a fundamental A. 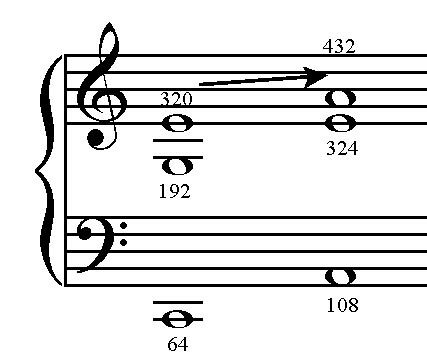 Nature creates this low A out of the perfect 4th (432-324=108) and the resulting “Tartini tone” is also clearly audible. The expressive core of Indian music is between the notes. Slides, ornaments and expressive intonation all explore this space, and it is in this context that one encounters microtones. One school of Indian music theory divides the octave into 22 microtones, another into over 50; however in actual performance one experiences these microtones as the journey from one purely tuned note to the next. In order to highlight the space between swaras, Indian string players use almost exclusively the 1st and 2nd fingers of the left hand (even for very rapid passages). In order to avoid being a caricature of Indian music the resulting slides need to be light and subtle. Think Kreisler and Casals! These notes are the basis of the North Indian Raga “Flying Swan”. They can be used very effectively to get the feel for playing with natural intonation over a drone. 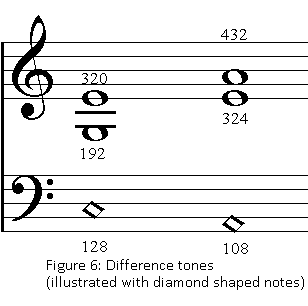 If you play with a colleague holding the C above middle C, and the difference tones (illustrated with diamond shaped notes) emerge, you will know that you have achieved the optimum placing for each note. If playing on your own, you can sit at the piano with your instrument, and keep a low C and G drone going with the sustaining pedal. Although a compromise, this also yields very interesting results. With your instrument (or voice) you can then improvise using the Flying Swan notes at slow, medium and fast tempi. You will find they naturally generate beautiful melodies almost by themselves, especially if you feel that you are exploring/unfolding the harmonic series, and that each combination of note and drone you play represents a different harmonic/emotional state. Next stage: Slowly explore the space between these notes with gentle slides. This produces exquisitely dissonant harmonic states, which ultimately resolve when the note arrives at its rightful position in the harmonic series. This journey from what in the west would be called “out of tune” to “in tune” is a vital expressive device in Indian music. If you really keep your ears open to the difference tones whilst sliding, it is an incredible sound- they will be dancing wildly in the background! Final Stage: Improvise melodies again in slow, medium and fast tempi. Make slides i.e. the space between the notes, an integral part of your expression. Further reading: a really entertaining introduction to tuning issues is How Equal Temperament Ruined Harmony (and why you should care) by Ross W. Duffin and a marvelously comprehensive account is given by W. A. Mathieu in his brilliant work Harmonic Experience. This section develops the concept of swaras in Indian music and introduces the elements of Indian music notation. Indian music is played almost exclusively over a drone, and the pitch of this drone is chosen in order to enable voices or instruments to sound with optimum resonance. The most common pitch centres are C, C sharp or D.
As in Western music, it is possible to chromatically alter many of the swaras to produce different ragas. In their default form (i.e. in the Ionian mode/major scale) each swara is known as shuddha. This is the swara’s “natural” position. The tonic (SA) and the 5th (PA) are immovable. Only one swara is allowed to be sharpened by a semitone: this is the 4th (MA). When it is sharpened it is known as tivra so a sharp 4th is Tivra Ma. Re, Ga, Dha and Ni can all be flattened by a semitone. When a note is flattened in this way it becomes komal so a flattened 7th for example is known as Komal Ni. A line under a swara’s name means it is komal, so Komal Ni is written Ni or N.
A dash above or next to Ma (eg. M’) meants it is Tivra (sharpened). Finally, a dot above a swara means it is in the upper octave (assuming a 3 octave range) and correspondingly, a dot below means it is in the lowest octave of this range. Sargams are the first introduction the student of Indian music receives in raga forms, and Figure 2 is a Sargam in Rag Bhairav this particular sargam was much used by Pandit Ravi Shankar in his teaching. The terms Asthai and Antara are introduced here for the first time. Both Asthai (“A” section) and Antara (“B” section) are normally repeated, giving an overall AABBAA form to the sargam. This section introduces 3 Rhythmic Cycles and two new Ragas. Returning to the sargam in Rag Bhairav in the previous section, the beginning of each 16 beat rhythmic cycle is marked with a double bar line, thus this sargam begins half way through a 16 beat cycle. This 16 beat cycle is known as Teental (or Tintal). It is divided into 4 vibhags (divisions or bars) of 4 beats. The first beat of the cycle is known as the Sam and is marked with an X. The 9th beat of the cycle is known as Kali (literally empty) and is marked with an O. Each vibhag can be marked with a clap, unless it is Kali, in which case it is marked by a wave. A really useful exercise at this point would be to sing the Sargam in Rag Bhairav from section 2, vocalising the name of each swara, and clapping on the 1st and 5th beats of each rhythmic cycle, waving* on the 9th and clapping on the 13th. *The waving motion is simply a palm up gesture, not a wave as in waving goodbye to a friend! In order to develop a sense of the vast territory of Ragas and Talas, we will now meet two of each in quick succession. The first raga, GUNKALI is an early morning Raga traditionally used to create a focussed atmosphere. The notes of this raga are introduced in Figure 1. 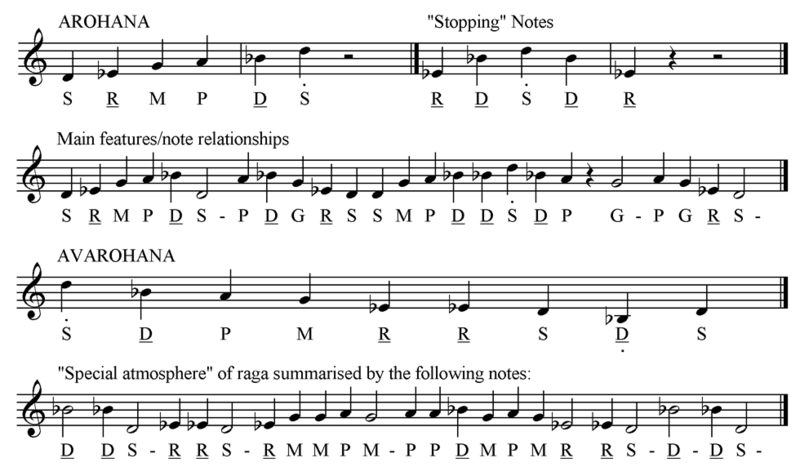 The rest of the figure 1 shows note patterns that further delineate the character of the raga. It is through note patterns such as these that one begins to understand what a raga is: an inspirational lattice of notes that could be defined as somewhere between a mode and a tone row. Figure 2 outlines a new rhythmic cycle or tala: Jhaptal. This is the most common 10 beat cycle in Indian music and is made up of 4 vibhags: arranged with the following matras (matra = beat). In Figure 2, Dhin Naa Dhin Dhin Naa Tin Naa Dhin Dhin Naa is the Theka: the verbal representation of drum strokes. Figure 3 presents a Sargam in Gunkali by Pandit Ravi Shankar. 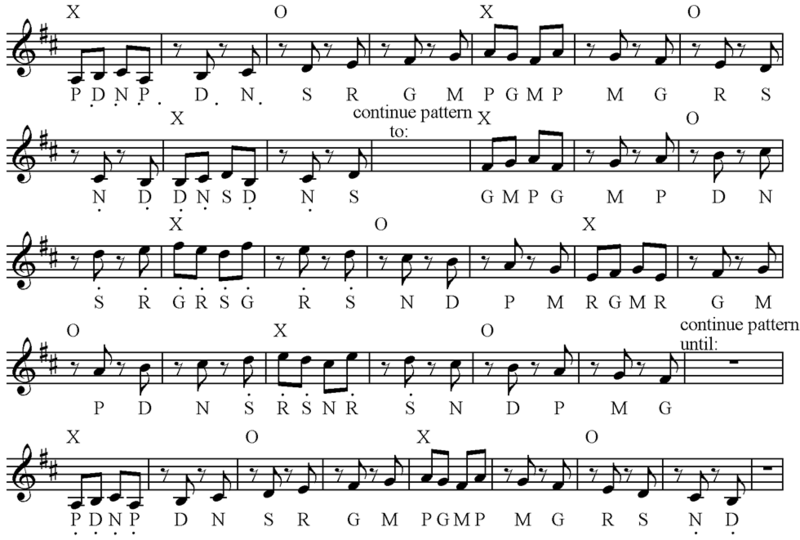 This can be played on an instrument, and then sung with the corresponding hand gestures outlining the 10 beat rhythmic cycle. Now we will meet Rag Todi and Rupak Tal. 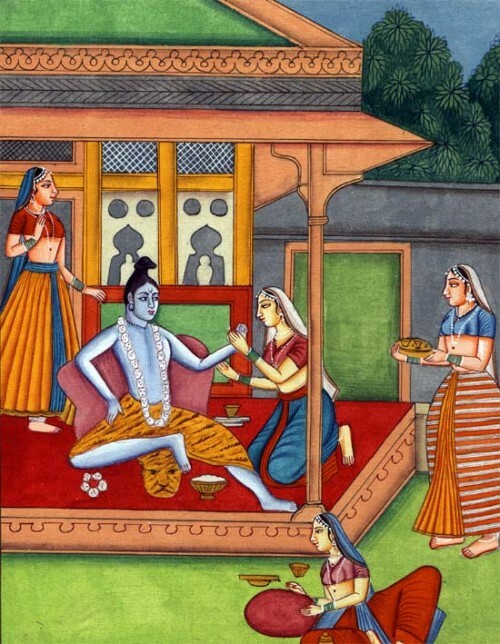 Figure 6 presents a Sargam in Rag Todi (also a morning raga) by Pandit Ravi Shankar, and Figure 7 is a Ragamala depiction of this important raga. Laya is an ancient concept rooted in the Vedic idea of an all embracing universal rhythm. 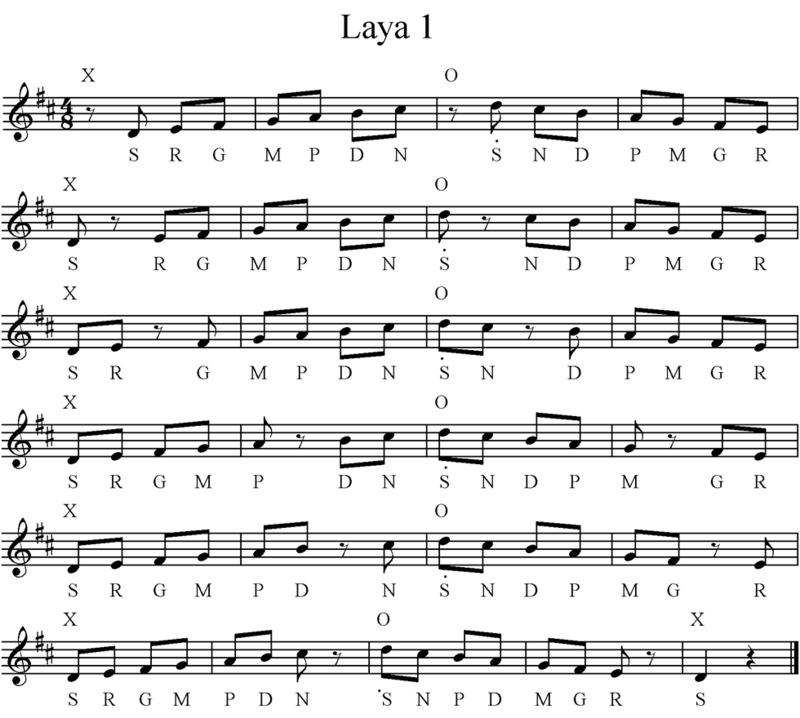 A musician with an exceptional sense of rhythm is described as “having good laya“. In an inspired performance, the musician feels the pulse of the music, and the pulses of his or her body within this universal rhythm. In a traditional Indian music education, the student covers a progressive series of exercises designed to lead eventually to this goal. Reminder: syllables corresponding to percussion strokes are used to organise rhythm. In North Indian Classical music, these are known as bols. 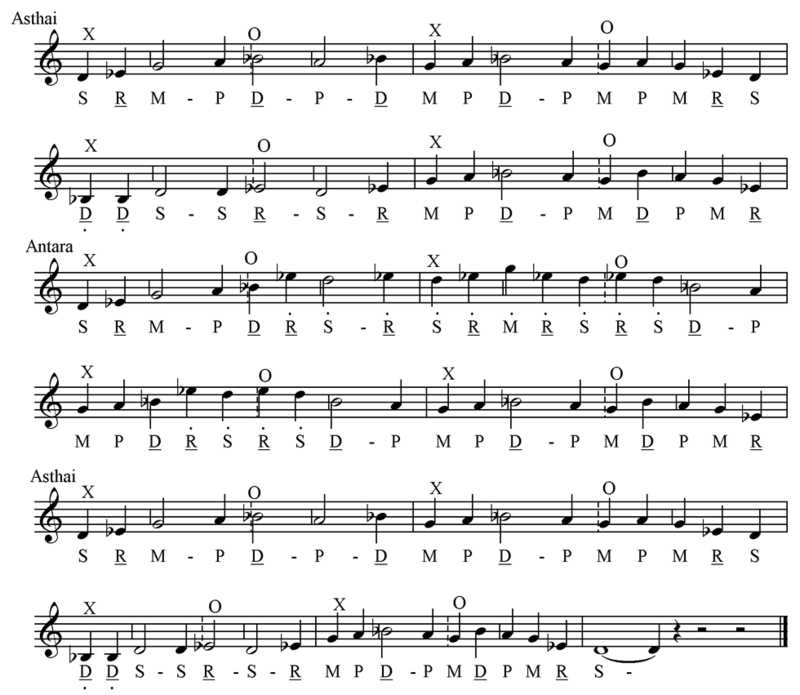 A collection of bols forming a rhythmic “groove” as in the above teental example is known as the theka. (Theka can be translated as “support”). This system offers an incredibly practical and simple method of organising rhythm, see Figure 1. 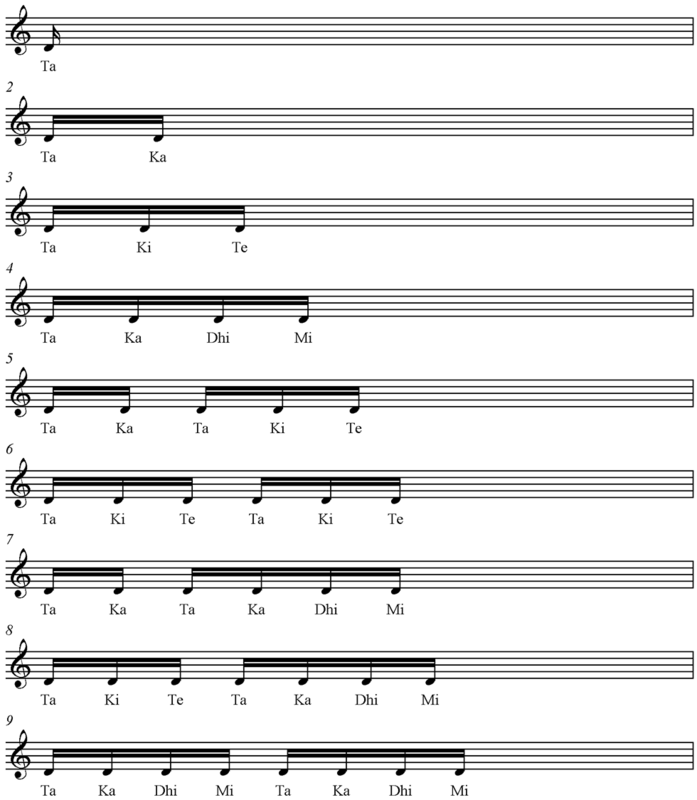 Exercises such as the following are used by students of Indian music to develop the sense of rhythm. 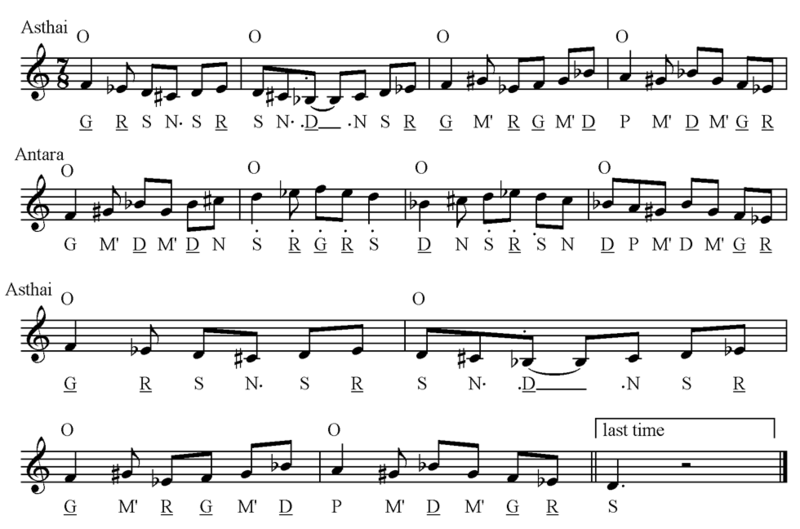 The first line of bols below shows this pattern with one beat per syllable. The subsequent lines spread the syllables out (one every two beats, then one every three etc.) whilst the clapping pattern remains the same. Now we will explore some rhythmic exercises which also involve pitch. They can be played on an instrument, but ideally will be sung to the sargam note names (Sa, Re, Ga etc.) clapping on each barline, except for those marked by a O (representing Kali or “empty”). On these barlines make the “wave” (palm up) gesture. They are all shuddha in the Indian notation i.e. without any indications of komal (flat) or tivra (sharp). This is so that they can easily be sung or played in any of the 7 note ragas explored so far. Having mastered the syllables alone in the following examples, you can then move on to singing or playing them, using the Western notation as a guide. 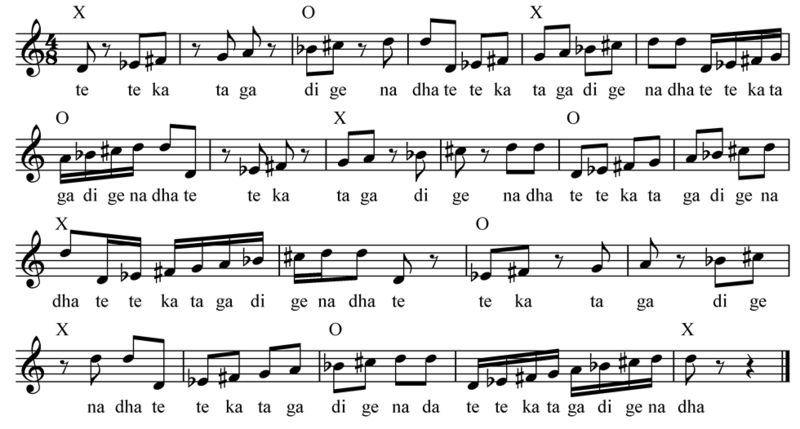 A Tihai is a rhythmic pattern repeated three times. It serves a structural purpose in an improvisation, acting as a punctuation mark between sections. If you are trying this exercise with a partner, get them to perform speak & clap/wave the drum syllables above (“Dha Dhin” etc.). Alternatively you could record them yourself. 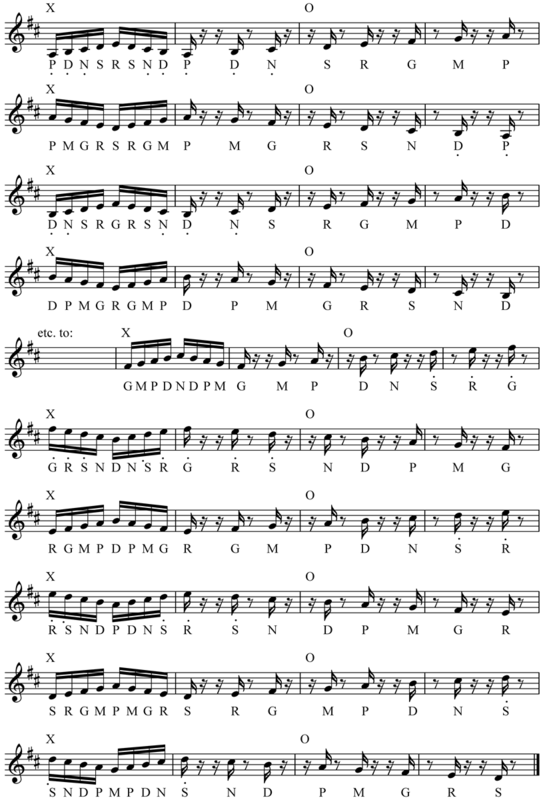 Having mastered the syllables alone in the examples (figures 5-8) you can then move on to singing and playing them, using the Western notation as a guide.